Tresaith Beach BeachOn a calm day, Tresaith beach has a tropical feel, whilst at other times westerly winds bring much more dramatic scenes of waves crashing against cliffs and rocks. The unusual feature of the northern end of the beach is a result of glacial activity when a glacier blocked and diverted the route of the river Saith, causing it to cascade in a waterfall directly onto the beach. There are plenty of rock pools to explore. They are full of interesting creatures and the rocks are covered in limpets, barnacles and mussels. Tresaith beach is a popular location for surfing, and also has a busy sailing club with racing on most Sundays throughout the season. ‘Saith’ is the Welsh word for seven and according to legend, an ancient Irish king set his seven troublesome daughters adrift in a boat. Landing on the Ceredigion coast, they met and fell in love with seven local farmers and no doubt lived happily ever after... their landing point in Ceredigion, according to the legends was Tresaith - the Place of Seven. Blue Flag and Seaside Award beach. Toilets, refreshments, shops, limited free parking. Lifeguard service provided 10:00 - 18:00 15 June to 1 September 2019. Dog restrictions to areas of the beach May to end September. 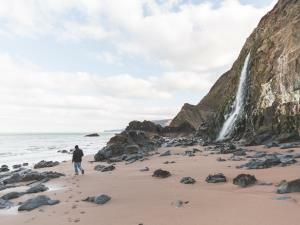 On a calm day, Tresaith beach has a tropical feel, whilst at other times westerly winds bring much more dramatic scenes of waves crashing against cliffs and rocks. The unusual feature of the northern end of the beach is a result of glacial activity when a glacier blocked and diverted the route of the river Saith, causing it to cascade in a waterfall directly onto the beach. There are plenty of rock pools to explore. They are full of interesting creatures and the rocks are covered in limpets, barnacles and mussels. Turn off the A487 Cardigan to Aberystwyth road between Tanygroes and Sarnau where signed for Tresaith and Penbryn.